Anne is the main character in the novel. An orphan and spirited young girl, she is intelligent and precocious. Unaware of the social norms of her adopted world, she behaves largely according to her instincts and as a result, she is both shocking and charming. She makes mistakes in social situations, she is inept when it comes to customary female roles, but she is remarkably intelligent. She learns to adapt the rules of her world to her own will and as a result, she is largely successful in establishing herself as her own person Anne is a strong character, one who can adapt to her circumstances while maintaining her own will and personality. An older unmarried woman who adopts, with her brother, Anne from an orphanage. Marilla is extremely traditional. She understands the role of women in the world and maintains this position with exactness and severity. Although her outward demeanor is severe and stoic, she shows a much more warm and tender side at various points in the novel. Marilla is the product of the strict social codes which determine a woman’s role and how a woman is to conduct herself in life. She is the perfect counter for the spirited and strong-willed Anne. At sixty years old, Matthew is the brother of Marilla and he is also a single man. His age and failing health lead him to adopt Anne in order to help with the farm. Although Matthew is afraid of women, he quickly warms up to Anne because of her outgoing nature and charm. He is the confidante and kindred spirit of Anne. His soft demeanor and sensitive nature are appealing to her sensibilities. Diana is Anne’s best friend. Cherubic and pretty, Diana is a traditional girl for the time and place of the novel. She is filled with romantic notions of romance and love. She and Anne become extremely close friends, although Diana lacks Anne’s intelligence and strength. Diana makes for an ideal young woman in the context of the novel. She is a passive girl who will assume her strict social role without resistance. Gilbert is Anne’s rival. He is handsome and intelligent young man, and he presents a real challenge to Anne. Early on, as a boy, he teases her and pulls her red braid. Form this point on he serves as an antagonist. She maintains her silence toward Gilbert for almost five years, until they both mature and the realities of adulthood force them both to see each other as worthy. 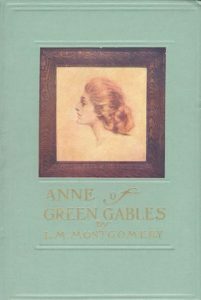 Their relationship become affectionate and supportive at the end of the novel as Anne sees Gilbert as a mirror of herself in some ways, and Gilbert sees Anne as an independent woman. She is the town gossip. Mrs. Lynde represents the voices of small-minded judgement. She has no ground on which to judge others, yet she freely and frequently offers her opinions. She is shallow and spiteful. Mrs. Lynde is, in short, everything that Anne is not.